SportMax Energy Shot is designed to be used as a pre-workout supplement for athletes. It has an impressive ingredient list that sets it apart from many of the other energy shots on the market. We were recently sent some samples of SportMax to review. One of the first reasons Sport Max is unique is the fact that each swallow should be held in the mouth for 20-30 seconds before swallowing unlike other shots that are meant to be consumed quickly. The reason for this is SportMax's Liquid B12 Booster. B12 works best when injected or absorbed sublingually . The citrus flavor of SportMax does little to cover up all the supplement taste. With all that's crammed into this energy shot, I think it's a given that it wouldn't taste like a Jolly Rancher. It's only 2 fl.oz., so after a few 30 second swallows, mission accomplished. Along with the mega dose of B12 and the 140mg of caffeine is a whole array of vitamins and amino acids which are listed below. I liked the fact that SportMax thought outside the box and used natural, low calorie sweeteners like Erythritol and Stevia. As far as the results are concerned, Sport Max Energy Shot delivers on that front as well. I began to feel the effects of SportMax in about 10 minutes. It provided a non-jittery lift that helped with my afternoon workout and afternoon activities in general. I would say that this shot can be used as any energy shot and not just as a pre-workout supplement. Because SportMax delivers such a high dose of vitamins and caffeine, consumers should heed the recommended use of no more than 1 bottle per day. Also, SportMax Energy Shot isn't recommended for those under 12 years of age. 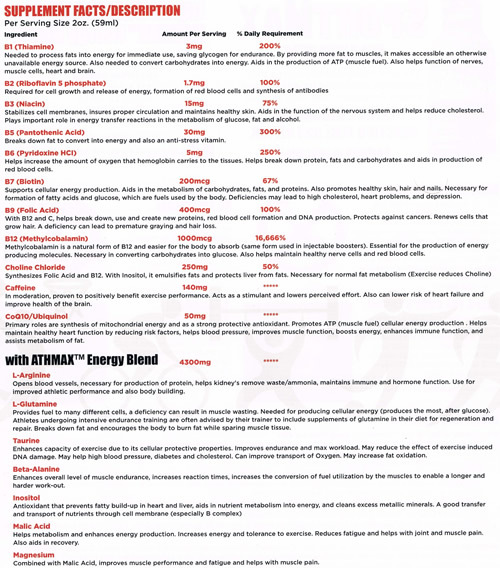 How Does Sport Max Energy Shot Compare? Sport Max Energy Shot contains 70.00 mgs of caffeine per fluid ounce (236.70mg/100 ml).